Canadian winters are cold. Don’t start complaining about that, they are supposed to be cold. After all we also have the North Pole on our territory. So when it is cold, and you have been skating on those frozen rivers for hours, what do you want to do? Warm up! 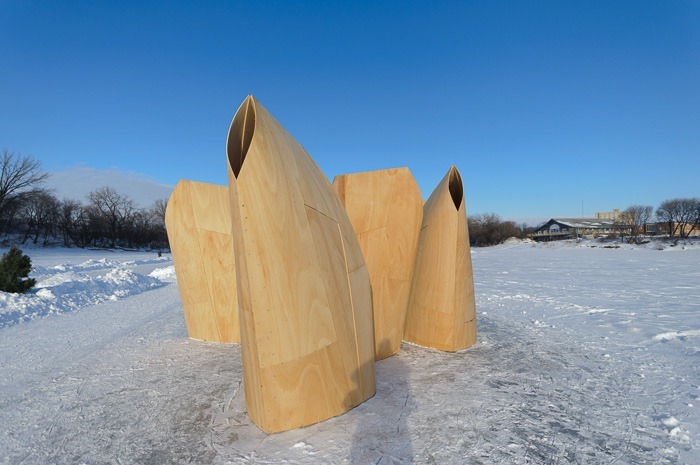 So this year again the City of Winnipeg organised an “Art and Architecture competition” with the theme of “Warming Huts“. Hmmm, let’s get warm together, shall we? So the warming hut of two years ago called “Woodpile” perfectly fit the bill. In fact to fuel the fire inside the hut, you’d be burning it up, little by little. In the end, the hut might not be so warm anymore, but you’d be, for sure. The leading picture called Jellyfish also protected you from the wind, something you’d definitely be looking for. This “Fir hut” certainly shows that there may be some improvements possible as far as drafts go, but in the right position, the wind is effectively blocked. This year’s creations though, seem to have forgotten the term “warming” from “Warming hut”. 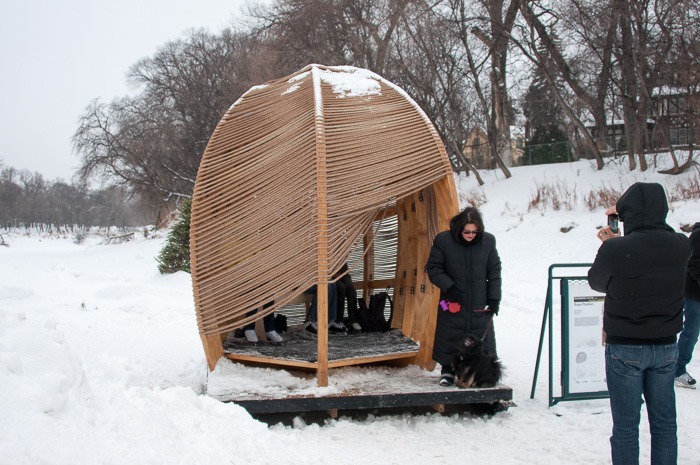 Walking from The Forks onto the Assiniboine river, the first “hut” is called “Big City”. Hmmm, this is the type of image you see when a house is under construction. Far from finished. 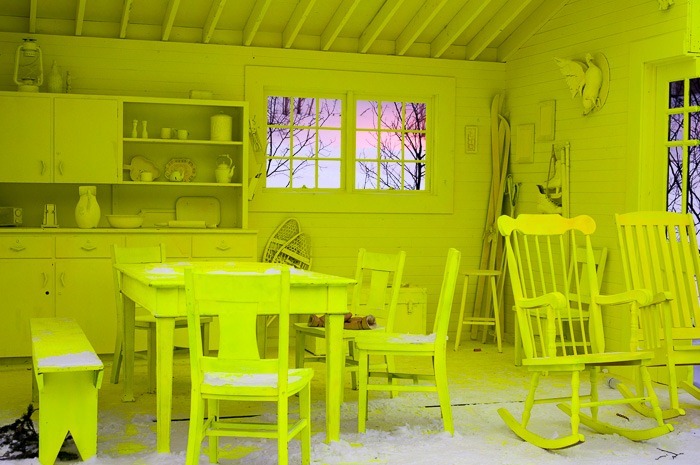 Made out of home insulation, you’d expect it to be warm. Not so. This is made from wood, covered with plastic. The inside is pretty windy and does not protect you from the cold. But let’s not be too harsh with the makers of this construction (let’s not call it a hut). The next construction seems to have forgotten about two of the terms of “warming hut”… Made of pipes and bells, this construction makes a lot of sound when the wind blows hard. Ok, nice, but warming…? Not really. On to the next construction. An open kitchen. 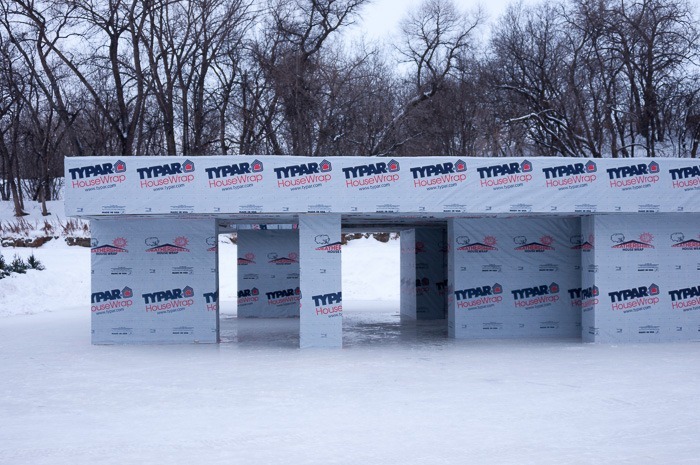 The sign states that this structure only comes to life when filled with a lot of people having fun in this kitchen. 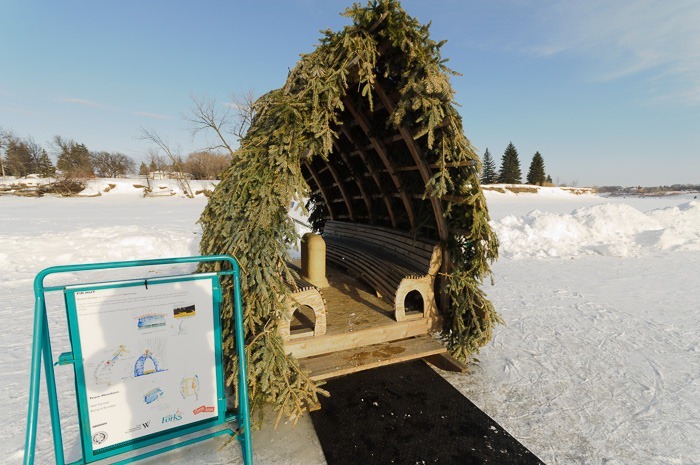 The open structure then allows for enough cold air to enter so that everybody can still breathe fresh and frozen air. It’s an idea… At least you can get shelter from the falling snow and from the wind, albeit from one direction only. And with many people in here, the cumulated body warmth should be enough for all to warm up. Then comes an even more questionable structure. From far, frozen as we are, this looks like a warm oasis on ice. Getting closer, you perceive some anomalies as far as protection against the wind goes. From close up… Well, there is no warming part to be had, and as far as hut goes, this allows snow to fall through on your cold and frozen toque. 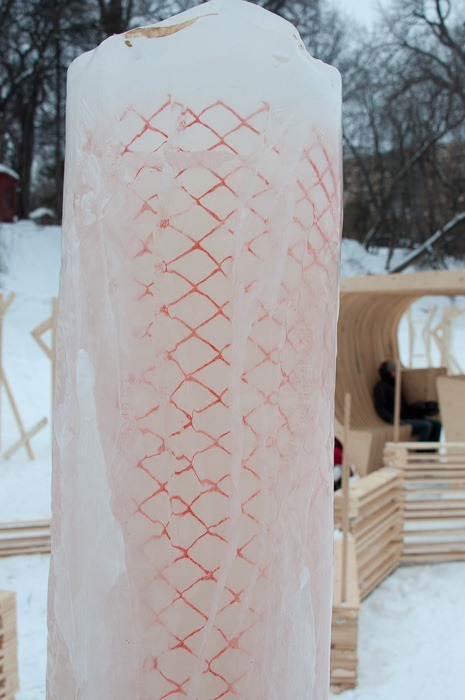 The structure is surrounded by columns of ice, reinforced with wire mesh. The whole again dipped in ice. All in all an cold affair, something that does make you question if the creators have read the “instructions”. Or perhaps they are like me in programming… Never read the manual until you are in trouble. Apparently no penalties to be had in this competition. 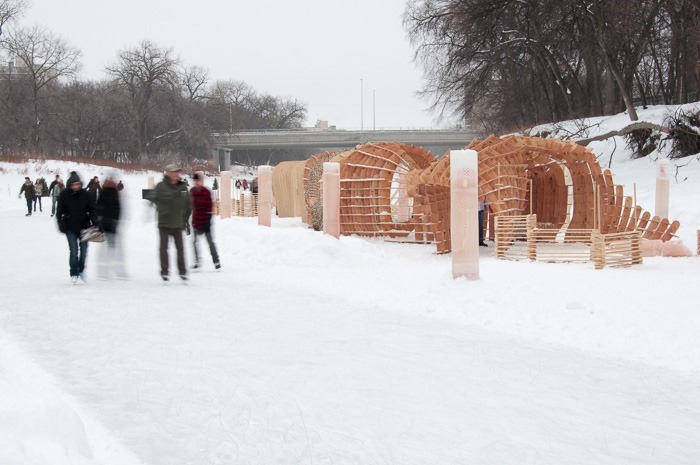 The last structure on the Assiniboine trail is Rope Pavilion. 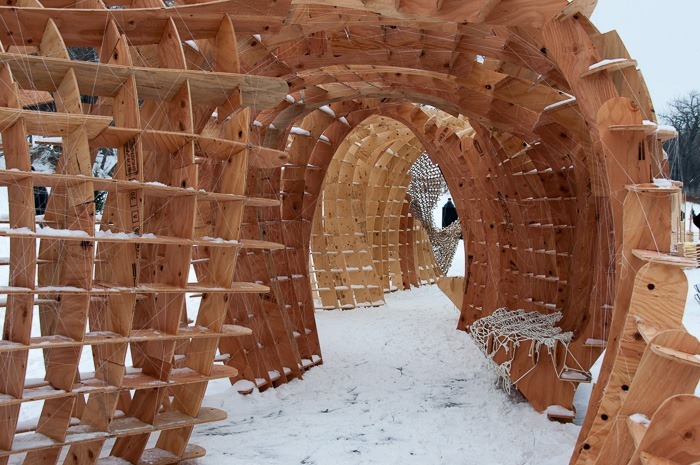 A structure made of wood and rope. This might protect you a bit from the cold, but I wouldn’t count on it. Also the word “Pavilion” seems a bit too much. Three people inside and the structure is full. The lady and her dog standing in front of the Pavilion did not fit in there. I always thought that pavilions were bigger than that. 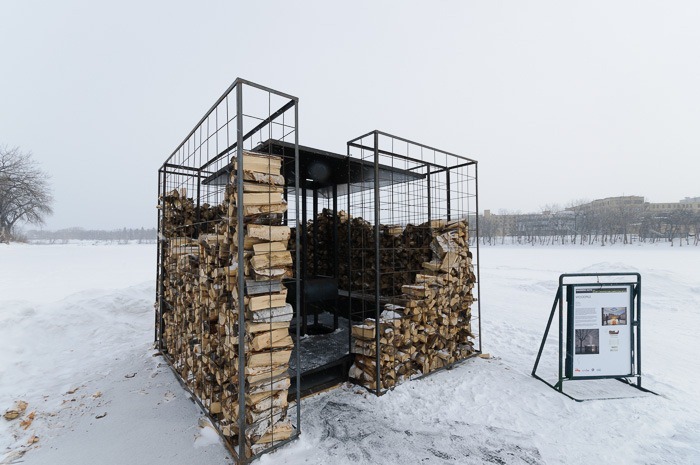 If I were reading the instructions of my clients in the same way the creators of these warming huts aka structures aka art have read the competition conditions, I’d be without clients in no-time. I have not read any instructions or conditions for this year’s competition. I am just asking myself where is the warming part here. 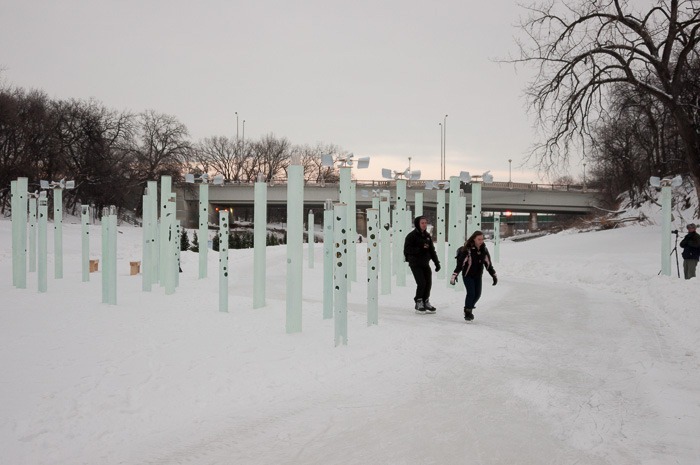 After having walked from the Forks to the Hugo access point, a few kilometres on the ice, I was cold enough to think about all this. Happily my car was warm, and even though it does not get the name of “Warming hut”, it did the demanded job of getting me warm again.